The Employment Situation report (released this Friday) in the United States is the main attraction on the data front this week. 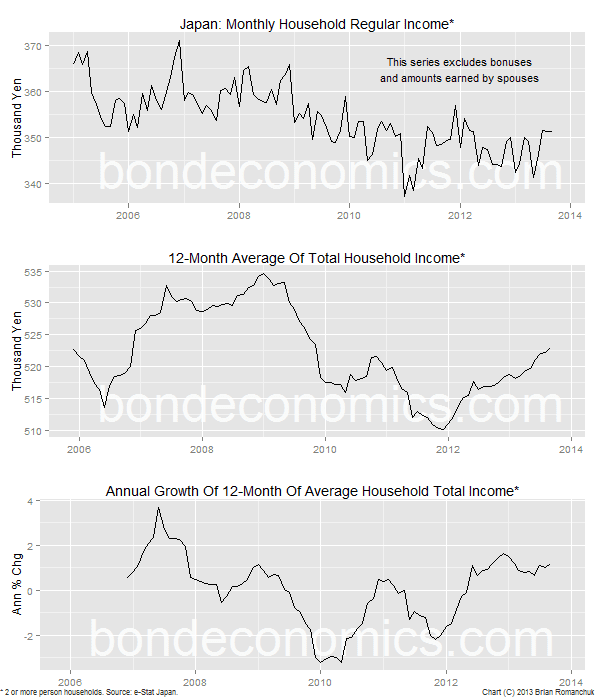 As always, I am mainly interested in the Household Survey component of the report; whereas the market focuses on the Nonfarm Payrolls number for some reason or another. I do not have any reason to expect the ongoing trends to break, although it seems the Participation Rate will have to stabilise at some point (which will break one trend or another). As I have noted before, the fall in Initial Claims is not telling us anything useful, and other sources for labour market data (such as the ADP estimate of jobs created or the Gallup Unemployment Rate) have not been too reliable. The Canadian Labour Force survey will also be released Friday. It will attract less attention than the U.S. data, but it could be interesting. Garth Turner lists some of the recent high profile layoff announcements in this article. The possibility exists that Canada will decouple from the United States economy, unfortunately in the wrong direction. My main topic for this entry is the progress of the wage inflation in Japan. The existence of large bonus payments makes it difficult to gauge monthly trends. However, the data in the chart above show little sign that Abe-nomics has had much of an impact on wage inflation. The "regular income" component of wages is not moving much, although the 12-month trailing total of overall nominal wages is still steadily marching up at around a 1% annual growth rate. Without wage inflation, there is little reason to expect much in the way of CPI inflation. In an interview with Bloomberg, Takahiro Mitani, head of the (Japanese) Government Pension Investment Fund argued that the Bank of Japan will probably miss its 2% inflation target. It is possible that Japan may hit 2% all-items CPI inflation in the near run (which is of interest to index-linked bond investors), but this will not be the result of underlying inflation. What will happen is that there will be a price level shock due to the increase of sales taxes, and import prices (particularly energy prices) have gone up. This upward bump of the CPI could matter if indexation was widespread within the economy; this could create a miniature "wage-price spiral". However, I do not believe that indexation is widespread enough for this to occur. In any event, the VAT hike represents a tightening of passive fiscal policy, and rising energy prices represent a hit the standard of living in Japan. In single-good economic models, a rise in the price of the one good represents a reduction in the real interest rate for producers of that good. Unfortunately, the economy is a multi-good economy, and rising energy prices will not reduce the "real interest rates" for domestic producers of non-energy goods and services. The only stimulative impact I see is that the weaker yen will help exporters. Since the yen is just returning to a somewhat less overvalued level, this may have too much of an effect.